Hi guys. I bought a new battery spare on iFixit and I've install it on my mac. Everything is apparently ok. 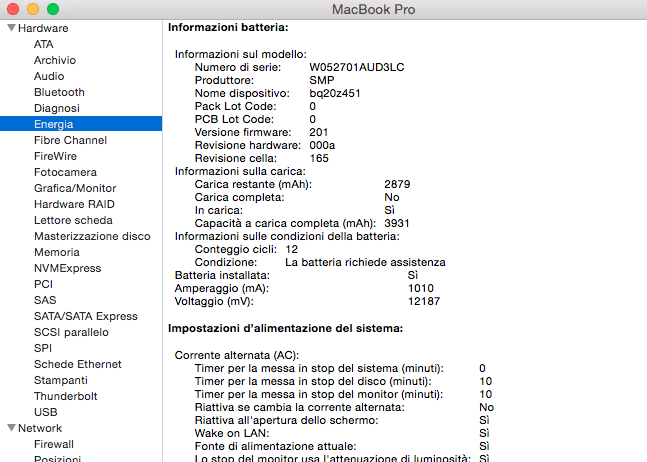 But it happened to me that the battery level was around 14% and the mac turned off without any screen message. It did want to turn on until I connected the magsafe. Unplugging the magsafe caused another immediately shutdown. So i left it plugged for some time and now it is properly working. Guys, thanks for replying me. Well, I did the SMC reset procedure as reported by Apple (connecting the magsafe, i pressed control-alt-maiusc at the left of the keyboard and power at the same time). I was sure the procedure got successful because the magsafe led turned green and then orange again. But apparently this not worked in my case. So i decided to open again my laptop and I performed the procedure reported not for Macbook Pro, but for the MacBook, i.e. I removed the battery and pressed power button for >10s. Now it properly works! This laptop will never die!!! Hey guys. I've got a new problem now. After some days, I've got again the message "battery requires assistance". Some suggestion? Is the battery that iFixit sold me not good? What does the system information battery information say? You can run this directly under application/utilities folder. Look under power section. At the least, the battery health condition should be normal. Other than that, do a SMC reset and charge the battery to 100% and let it drain couple of times and see if this problem goes away. I have the same problem... SMC Reset done, but no change. Battery removed, pressed Power Button, no change. When it´s about 7-9%, the macbook turns off without warning. Any more ideas what i can do? It´s a new battery from ifixit (SMP). Hi Stefan, try also to run a calibration procedure. When the mac switches-off at 7/6%, try to plug the magsafe just to turn on the PC, then wait to reach 0% and the completely switch-off. i did not come to 0%. When i plug in the power cord the mac starts, but when i plug it off the mac is "alive" only for a few seconds... Did not come lower than 7-9%. I see. How do I know if my battery has a failure also? Is there any way to test it? Mario Barbareschi será eternamente grato(a).